I think I’ve mentioned countless times that the smell of freshly ground and brewed coffee (along with freshly baked breads) are one of the best things to ever wake up to, walk into or simply just to daze off into a dream. What I would really like is, a simple bean-to-cup robot who knows exactly how I like my coffee with simply a command and a push of a button. I want to roll out of bed in the morning, walk to my coffee robot, press a button, shuffle to the bathroom, shuffle out and have my coffee made perfectly for me. Luckily for us, the people at Philips Saeco have got that covered for us! For the last 25 years, Saeco has redefined the coffee-at-home experience, always searching for the next big bang in terms of ideas, functionality and creativity. 2 years ago (2009), Saeco International Group became part of the Philips family and since that partnership was formed, they’ve gone on to develop impressive and outstanding coffee machines. 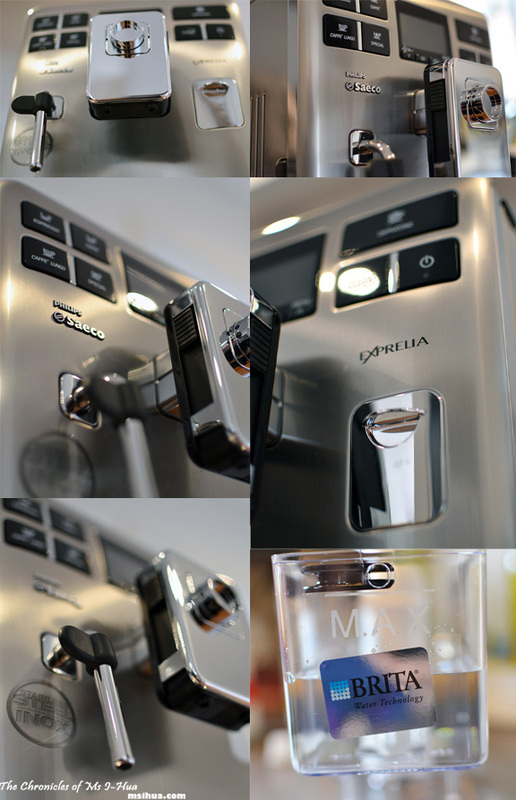 The coffee which is produced from the beautiful Exprelia coffee machine allows you to customise your coffee just the way you like it. 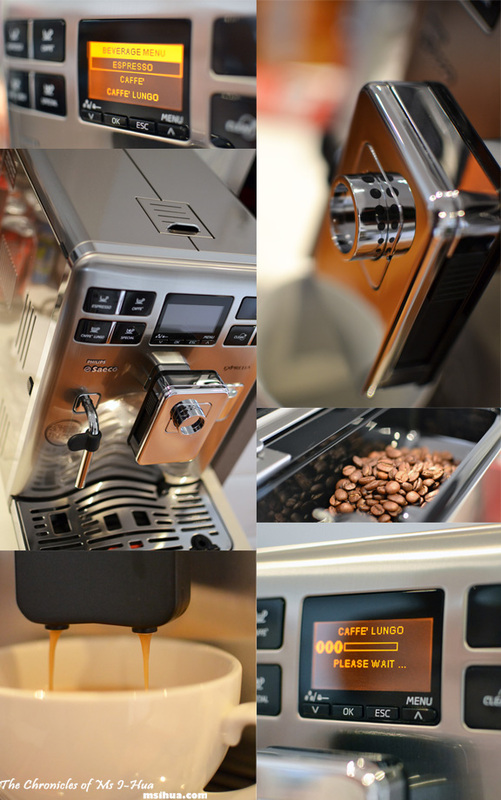 You can choose from the coffee length, temperature, intensity, crema and body structure to suit your requirements. Which is just the way I like it. You see, I am very picky with my coffee and I like my coffee strong, dark, intense and hot. With this baby, you can choose to buy your coffee beans from your favourite cafes. As a true blue Melburnian, I can attest to being the perfect coffee snob and won’t hesitate to try out a variety of coffee beans from the cafes around the city. However that being said, you can also purchase a bag of beans from Saeco itself. You can choose how you want your coffee beans to go through the grinder. 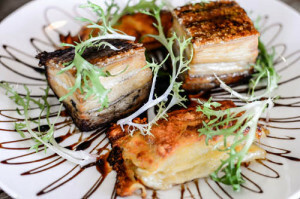 From coarse to fine, the choice is really up to you. I like mine somewhere in the middle. If not, there’s always an option for pre-grounded coffee to be inserted. The Exprelia itself isn’t very big when you think about it, so you won’t need to be worried about it taking too much space on your kitchen bench. It comes in a fabulous stainless steel finish as well as a shiny chrome finishing on various parts of the machine. One really cool thing about the Exprelia is that it has an adjustable coffee dispenser to suit the size of your coffee cup or mug! And if you are like me and usually leave the house in a rush and only have time to dispense coffee into your travel mug, this Saeco baby allows you to remove the dispensing spout so that you are able to fit your tall travel mug underneath it perfectly! No mess and no hassle. WIN! As I’ve mentioned earlier, when I’m not running around in the morning like a headless chook, and am actually organised and early, I would want my coffee (in this case, my Latte) ready when I shuffle out of the bathroom in the mornings at a touch of a button. With the integrated milk carafe on the Exprelia, it’s possible as frothed or hot milk is automatically poured into the beverage along with the coffee. You won’t need a separate milk frother for milk-based coffee beverages. The milk carafe also self-cleans separately after each cup. There is also an option if you much prefer using an external milk frothing jug to make just enough milk without having to worry about making space in the fridge (as any left-over milk in the carafe must be kept in the refrigerator along with the carafe). This is where the Exprelia’s clever design comes into play. It has thought about that and about how one might not want to use the automatic milk function. In terms of cleaning, if you are used to other coffee machines which uses coffee pods, you will also be used to easy cleaning. You do so by opening the collection drawer and tossing the used pods out into the bin. You do so by pulling open the front part of the coffee machine, as you would a door. This is actually one of my favourite aspects of the actual built and design of the Exprelia, the door and its steady hinges! 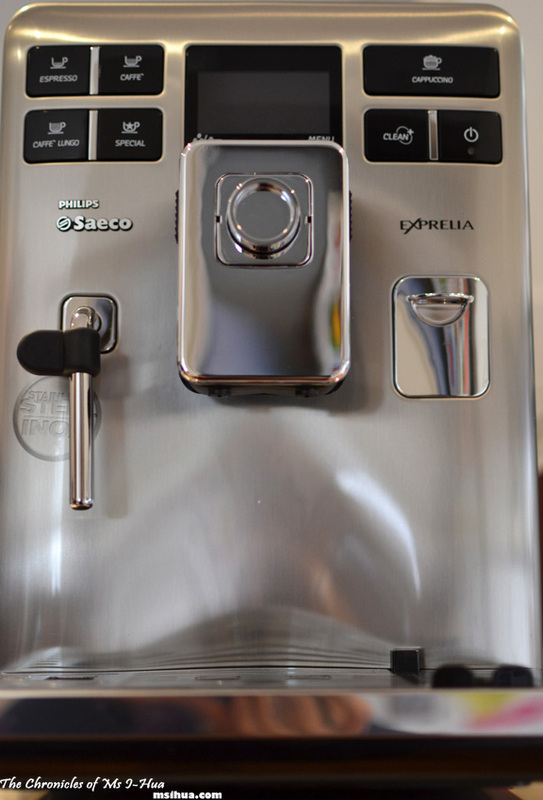 SBS (Saeco Brewing System): allows you to adjust your espresso’s intensity, altering the crema and body structure as it is dispensed. 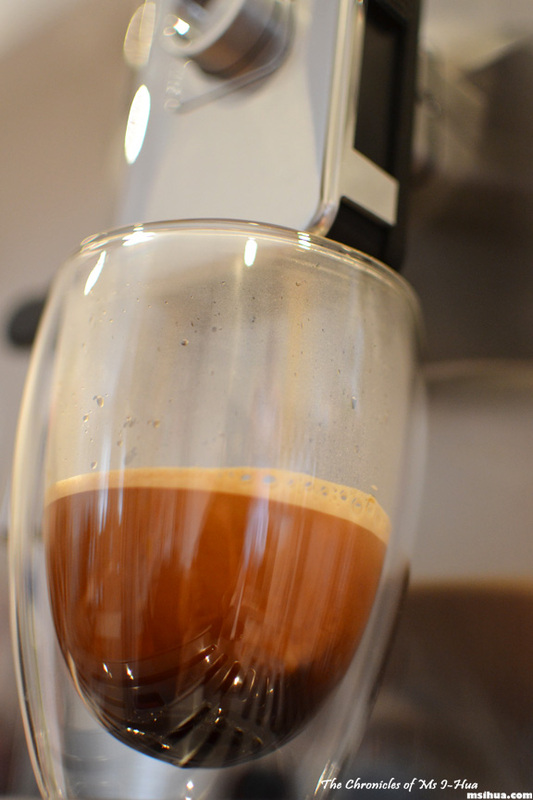 Simply by turning the knob you can prepare the crema exactly according to your taste. Double Boiler: two independent circuits assure quick and convenient coffee preparation directly after frothing your milk. Easy Beverage Selection: with the immediate beverage selection, you can enjoy your personally customized beverage specialty at the touch of a button. Autocleaning & De-scaling: thanks to the automatic coffee circuit rinse, automatic milk circuit rinse and de-scaling cycle, you are guaranteed perfect enjoyment every day and maximum longevity for your machine. Full Automatic Milk Function (Milk Carafe): with the integrated milk carafe, all you have to do is fill it with milk and simply select your favourite milk specialty. With the integrated milk function, the milk can be served either hot or frothed. 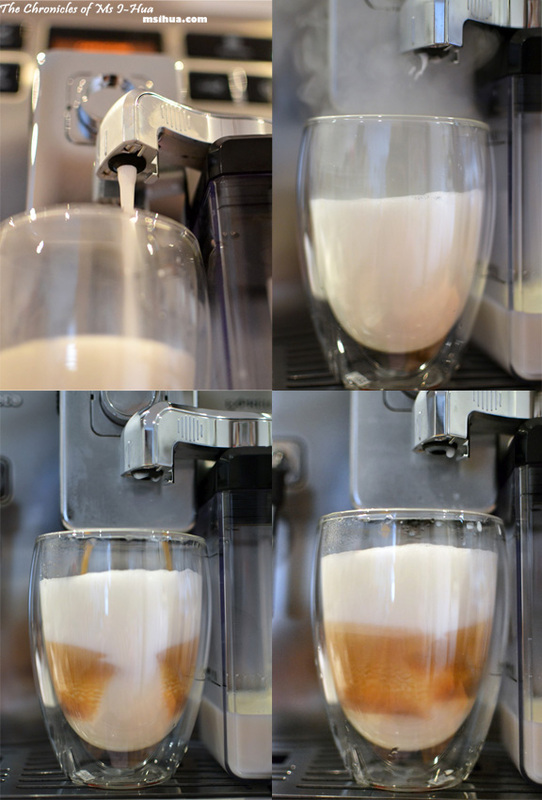 By simply pressing your favourite beverage – whether it is a latte machiato or a cappuccino – your drink will be served within seconds as creamy froth or hot milk will be poured automatically into your beverage. The advanced milk management includes two automatic steam rinsing cycles. And for thorough cleaning, the whole device is easily dismantled. Removable Brewing Group: the brewing group is at the heart of every fully automatic coffee machine and it should always be kept clean. A task that doesn’t get any more convenient than with a Saeco. All you do is remove, rinse and re-insert and you’re finished. Full Customisation: choose your favourite coffee blend and adjust the coffee length, intensity, temperature, crema and body structure until they all meet your personal taste perfectly. This video is a cool animation designed to show you how the Philips Saeco Exprelia actually works! What do I think about the overall functionality and speed of the coffee machine? Minor gripe with the Exprelia, I find that this machine does prompt me to empty its drip and used grounds drawer more often than I would like. This isn’t due to the dump box being full, but more the drip box from the constant cleaning it automatically performs after each coffee run, which technically isn’t a bad thing, as you do want your machine to maintain its cleanliness. At the start, there is a bit to read from the manual if you’ve never own a fully automatic coffee machine. But after the first few times you’ve used this machine, it’ll be a breeze. Well, since Christmas is right around the corner, the good people at Philips Saeco are having an exclusive offer for their potential customers! An exclusive Philips Saeco Xmas Gift Pack Offer (valued at up to $1500 rrp) awaits, if you purchase an eligible Philips Saeco or Saeco coffee machines from participating Australian retail stores between 1 November 2011 and 31 December 2011. 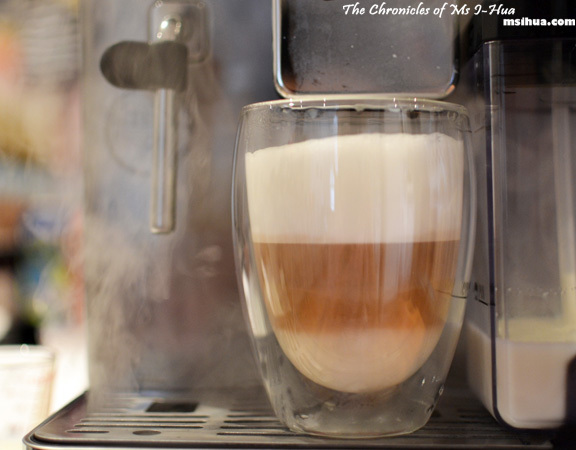 I will be hosting a coffee party today (Sunday) testing out both my Nespresso Citiz and Aeroccino and the Philips Saeco Exprelia coffee robot. We will be drinking cappuccinos, espressos, lattes, all with a touch of a button. We will be using both coffee pods and coffee beans in this product match-off! Michelle recently posted…One of the best Peking ducks I&apos;ve ever had. Lol.. the Nespresso is a really easy to use machine. The Saeco is if you want to go up to the next level and you get to use whatever beans you want! WIN! Thanks Lorraine! I’d be curious as to what you think of the Saeco as well! Vien @ We Dare Food recently posted…Where to get Tonkatsu in Singapore? No problem! Yeah it’s a perfect gift for dad! This sounds incredible! Kiiiiinda wish I’d been offered this instead of the AirFryer 😛 Love how it grinds the coffee beans fresh for you! Also… waaaaah, wish I could’ve been at your coffee party! Mine’s being delivered today!!! WOOOT WOOT! WE should so do another coffee party trying out different beans from St Ali, Market Lane and Axil!! You ARE gonna have so much fun with it! Have you had a chance to test this machine out since? Is it easy to clean out the built in grinder? My last Saeco automatic had stale beans that I just couldn’t remove from the inside. Oh yes I have! I’ve used it quite consistently. I just don’t put as much beans in the grinding pot (however, it can be easily removed) as well. How is this machine to use with different types of milk drinks? I thought it only had one programmable button on the right side for milk drinks? I would like to make at least two tupes of milke coffee drinks (Latte and Macchiatto). do I have to re program the thing every time, or can you store more coffee types in that menu? Wow its too shinnyyyy. Great, wanna buy it. Wow, look like it works really great. I will buy one to replace my old one. Thanks for sharing!